Dr. Nancy Hendricks is an award-wining author, historian and dramatist. She holds a doctorate in education, a master’s degree in English and a bachelor’s degree in English and theatre. She taught English at Arkansas State University and served as director of ASU alumni communications until moving to Hot Springs. In 2013, she combined her talents of research and writing to publish “Senator Hattie Caraway: An Arkansas Legacy” (The History Press), with an introduction by former U.S. Sen. Blanche Lincoln. Many Arkansans are not familiar with Caraway’s story. In 1931, U.S. Sen. Thaddeus Caraway died, and his wife, Hattie, “filled in” for him during the remainder of his term, as was often the case at the time. But Hattie did something unusual – she chose to run for office in a special election the following year, and she won, thereby making her the first woman ever elected to the United States Senate. The book emphasizes the trials and tribulations of this groundbreaking two-term senator, such as the fact that there were no nearby restroom facilities for a woman. Using her gift of drama (Hendricks is a member of the Dramatists Guild of America), she loves to take her portrayal of Hattie Caraway “on the road.” She wrote a one-woman show titled “Hattie to Hillary: Women in Politics,” which she performs in character and dressed in period costume as Caraway. Contrary to the opinion of some, Caraway’s accomplishments were many, and she had a true desire to help people. During the process of researching the book at the archives at the University of Arkansas and Arkansas State University at Jonesboro, she connected with Caraway’s granddaughter, who shared rare family photos with her. Many of the previously-unseen pictures appear in the book. 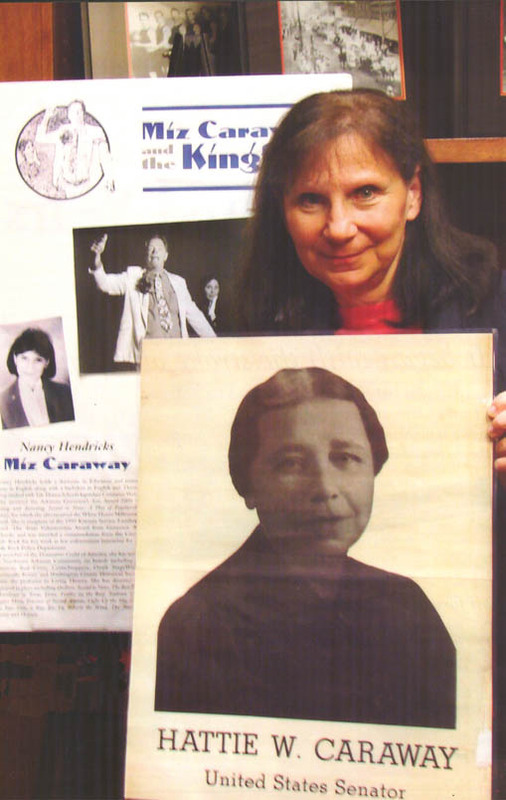 In addition to her plays “Second to None” and “Boy Hero: The Story of David O. Dodd,” Hendricks wrote the play “Miz Caraway and the Kingfish,” which portrays the colorful story of Hattie Caraway’s 1932 campaign with Huey Long. Its New Orleans production was held over for an extended run and nominated by the American Critics Association for “Best Play Produced Outside New York.” She also wrote the play “Dear Mrs. Caraway, Dear Mr. Kays,” and is author of the book of the same name (Kendall Bostwick Publishers). Her book “America’s First Ladies: The Remarkable Women of the White House” was published in 2015 by ABC-Clio, and 2016’s “Notable Women of Arkansas: 100 Names to Know” (Butler Center Press) was named an “Arkansas Gem” by the Arkansas State Library. Hendricks’ hard work and attention to detail have certainly paid off. She is the recipient of a Pryor Award for Arkansas Women’s History, the Arkansas Governor’s Arts Award and the White House Millennium Award, to name a few. The Hattie Caraway book was so well received that Cosmopolitan named it to the list of Twenty Political Books Every Woman Should Read. Hendricks is “both excited and scared” to be working on two books at once, both of which will be published in 2020. One is about postwar American women and the other is a more light-hearted adventure with the working title America’s Haunted History: True Stories of the Country’s Spookiest Places. To find out more about Hendricks or to purchase her books, search for Nancy Hendricks or her book titles on Amazon where her Author Page also can be found.